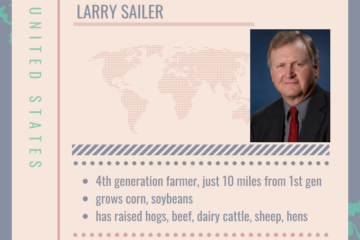 2018 Global Farmer Roundtable – Larry Sailer from the U.S.
Larry is a fourth generation Iowa farmer. 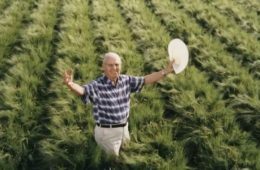 He bought his first farm in 1972, raising corn, soybeans, oats, and alfalfa, as well as hogs, beef and dairy cattle, sheep and laying hens at various times. He currently farms 400 acres of corn and soybeans, with most of the land under no-till. All of the crops use GMO technology in order to make his conservation program feasible. This will be his 45th harvest. As part of his farm operation, Larry considers being an agvocate among his everyday chores. He began giving interviews back in the 1980s during the US farm crisis. Fifteen years ago, he joined the speaker corps of the National Pork Producers. 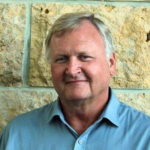 Eleven years ago he joined the Iowa Farm Bureau speaker corps. Then social media happened, and now Larry has a worldwide network that can reach millions of people. 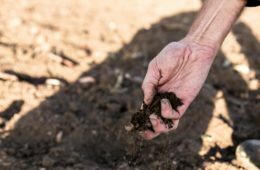 He’s passionate about sharing what modern agriculture is all about because public opinion is influencing policy regulations that impact how we produce food.